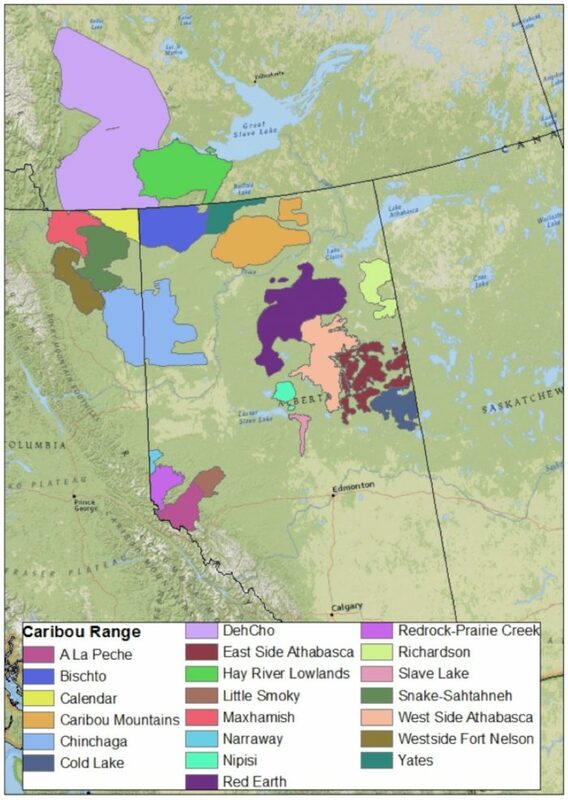 Range delineations of 21 populations of woodland caribou. Calf–adult female ratios and adult female survival were monitored annually for various periods within each range between 1994 and 2015. 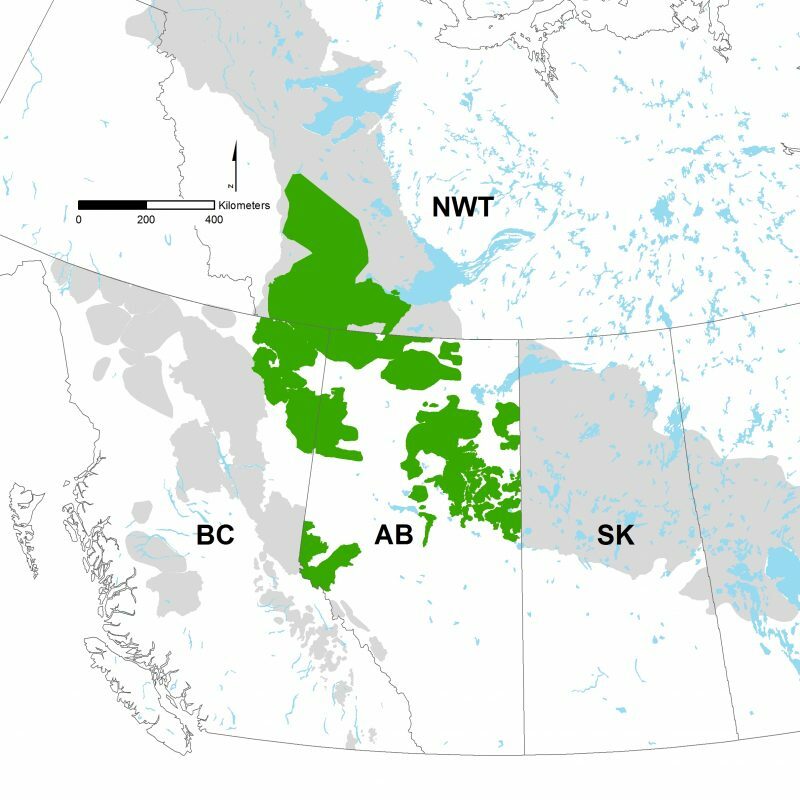 Note that the Cold Lake range extends into Saskatchewan and that this portion of the range is not shown. In light of global climate change, understanding how species respond to climate variability is now fundamental to wildlife conservation and management. Impacts of climate change have focused on expanding deer and moose into caribou range, and the subsequent increase in predators that incidentally prey on caribou. Climate change, however, may impact caribou populations in other ways. Specific to predation, increasing freeze-thaw cycles in winter may make it easier for predators to run on snow, leading to increased caribou-predator encounters. Climate variability may also directly affect caribou reproduction and survival through metabolic mechanisms (e.g. forage availability, energy expenditure). The CMU evaluated how annual weather variation effects the demography of 21 boreal and central mountain caribou populations, monitored between 1994 and 2015. Researchers assessed how annual changes in seasonal minimum and maximum temperatures, seasonal precipitation, frequency of freeze-thaw events, and indices of plant productivity impacted adult female survival and calf-to-adult female ratios. Recruitment was negatively affected by increasing average temperatures across the majority of seasonal analyses, with effects particularly strong in the winter before birth. During this period, an increase in the average minimum temperature from –20°C to –15°C resulted in a predicted decrease in overall recruitment from 0.135 to 0.098 (a 37% decline). Recruitment increased with increasing snowfall in the year before birth. Adult female survival was more impacted by weather effects during the preceding spring and autumn. In both seasons, adult female survival responded to plant productivity. These results suggested that a female’s balance of body reserves from the preceding year influences annual survival and that this balance is dictated by building resources in the previous autumn and spring. 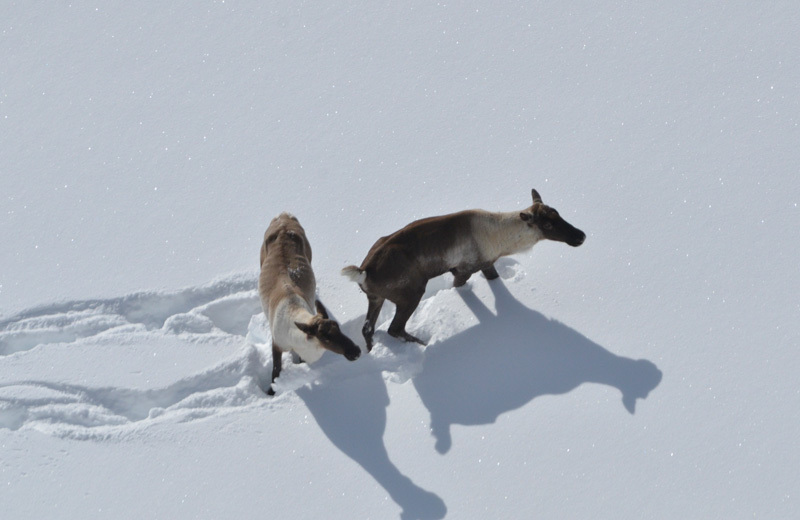 Comparing the two demographic rates, weather-mediated effects on calf-to-adult female ratios and adult female survival appeared to have similar impacts on caribou population dynamics. Future work will evaluate the potential influence of other climatic variables (e.g. length of snow cover, average daily snow depth), varying the temporal scales of analysis, and assessing for potential interactions between climate variability and landscape disturbance.